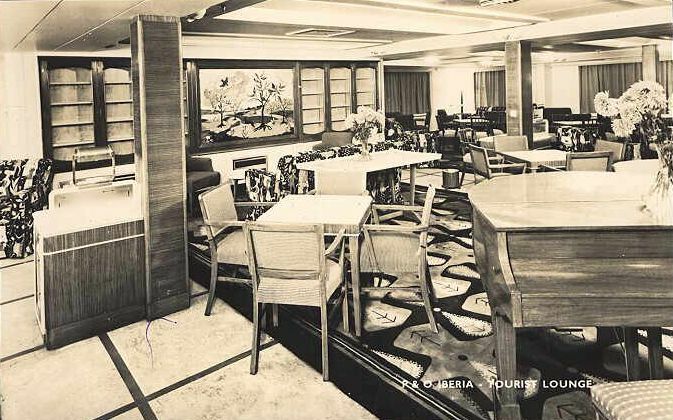 This painting of Iberia, by an unknown artist, was recently auctioned for just £22. 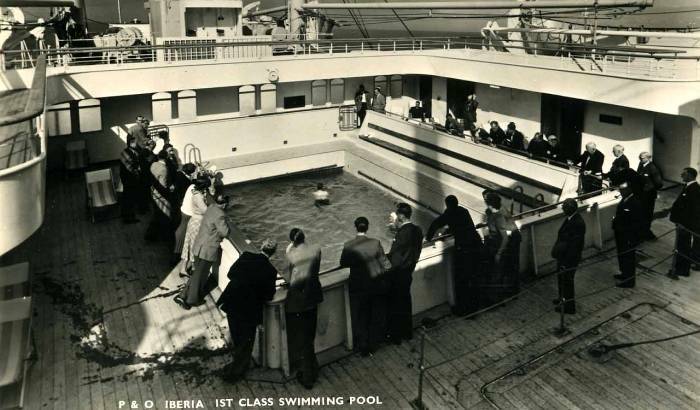 During her short, 19 year life, Iberia experienced numerous problems, including collisions with other ships, frequent machinery breakdowns, electrical malfunctions and fuel leaks. 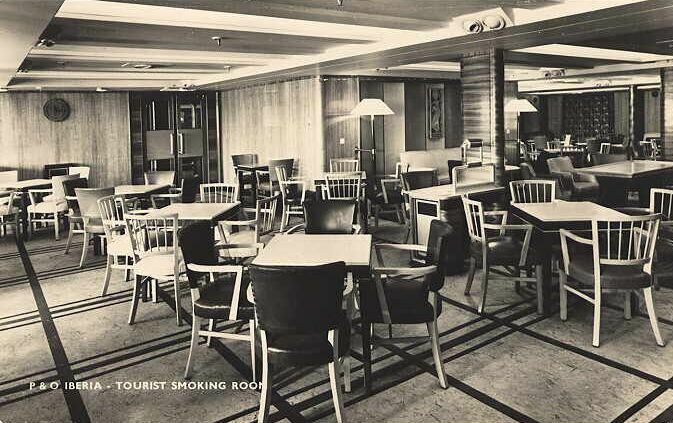 She was taken out of service in April 1972, the first of P&O's post-war passenger ships to be withdrawn, as a result of her history of poor mechanical performance. 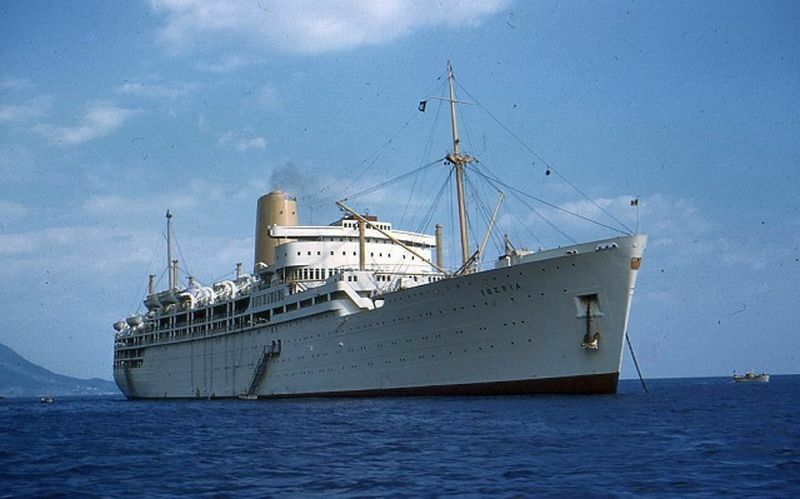 She was survived, albeit for only a short time, by Chusan, scrapped in 1973; Himalaya scrapped in 1975, and Arcadia, scrapped in 1979. 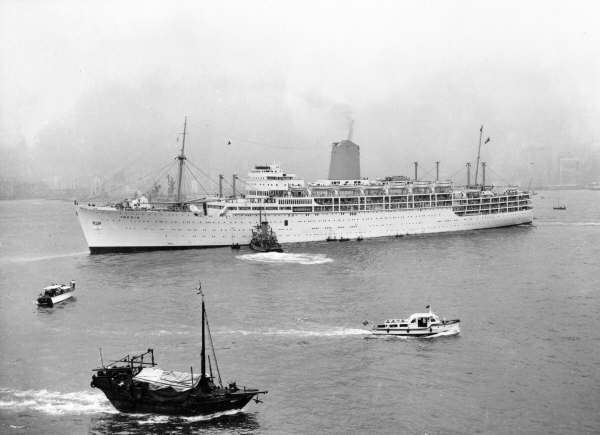 Completed in 1954 for the Peninsular and Oriental Steam Navigation Company, Iberia, together with Himalaya, Arcadia and Chusan, provided a regular passenger service between the United Kingdom, Australasia, India and the Far East. 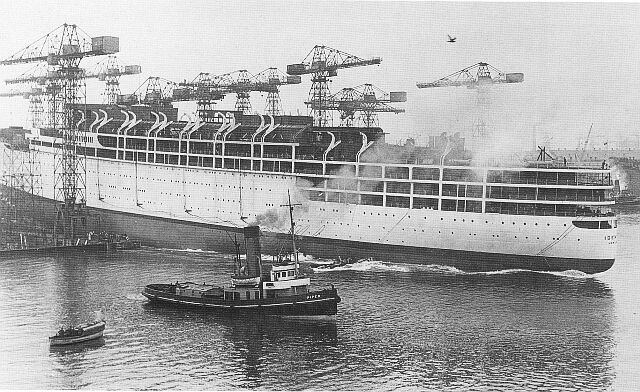 Iberia in build at Harland & Wolff's Belfast shipyard. 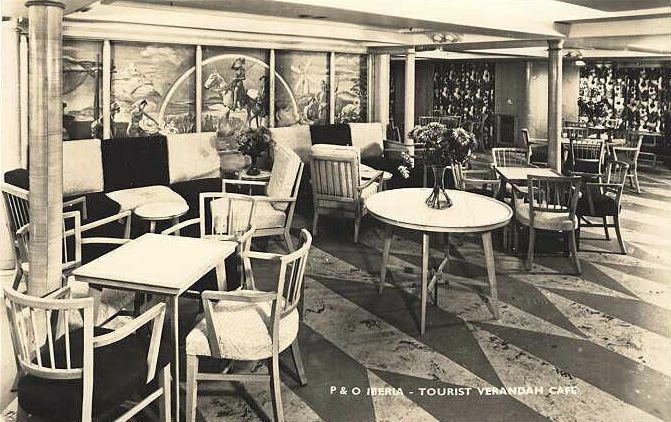 Her name was derived from an earlier ship, P&O's first purpose-built vessel, which entered service in 1836, in turn named after the Iberian Peninsula, the westernmost portion of the European subcontinent, where P&O first traded. 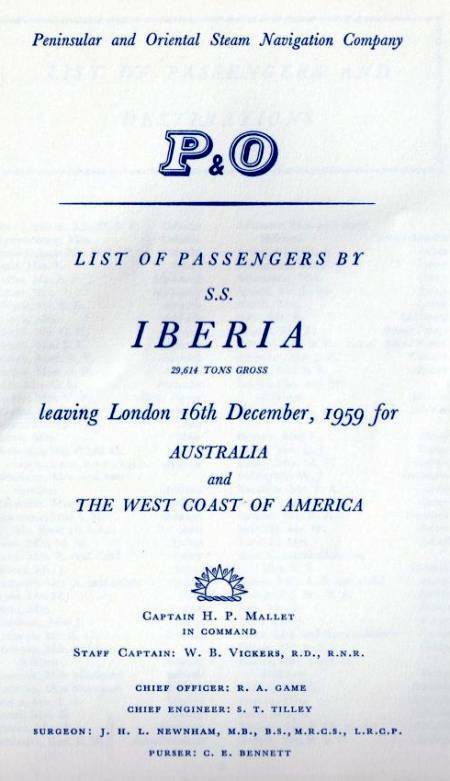 Iberia was launched on 21st January 1954 by Lady McGrigor, wife of the First Sea Lord, Admiral Sir Rhoderick McGrigor. 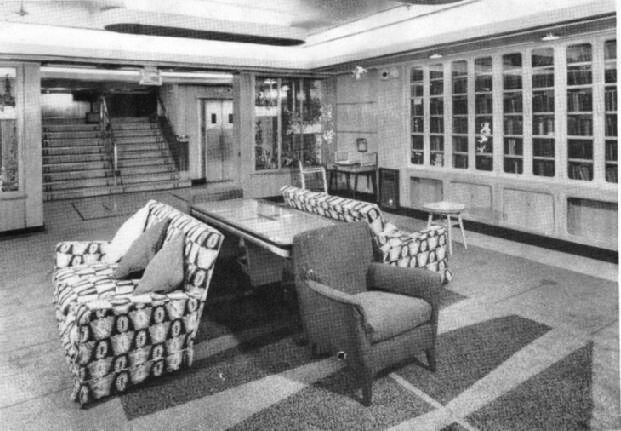 After launching, she went to the fitting out wharf, where much of her interior design work was carried out by the architects McInnes, Gardner & Partners of Glasgow, and included several new innovations. 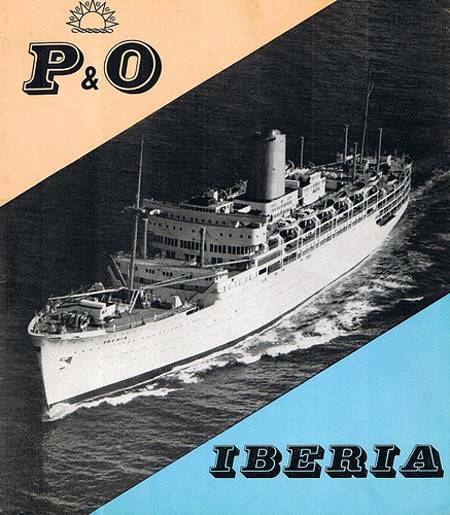 Iberia was handed over to P & O on 10th September 1954. 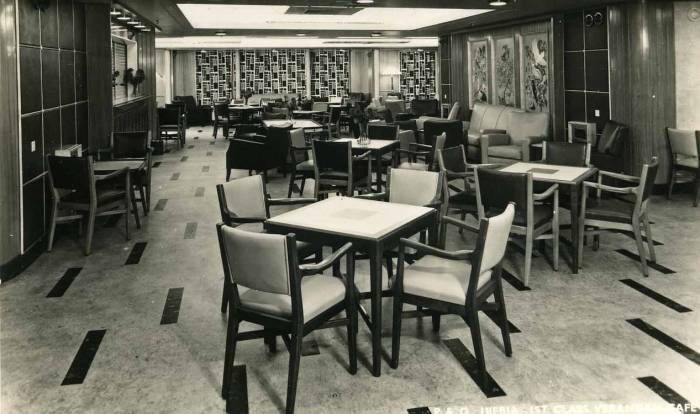 She had accommodation for 673 first class passengers and and 733 tourist class, and at first voyaged between Southampton and Australia. 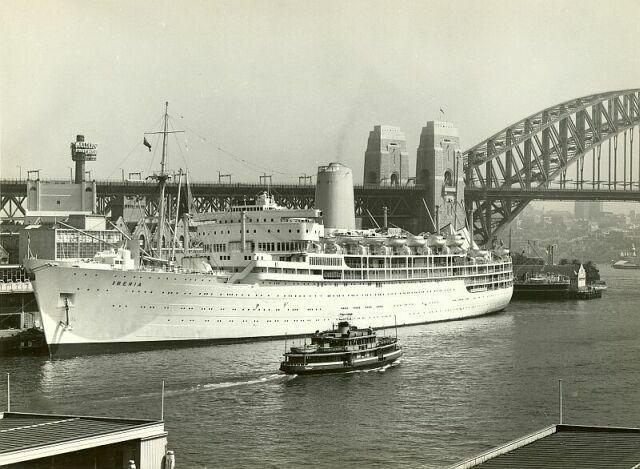 She made her first round the world voyage in 1959. 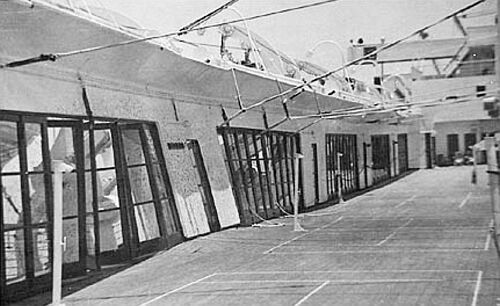 Temporary repairs were made at Colombo, where vertical irons girders were welded to the ship's side, in order to support her upper decks. 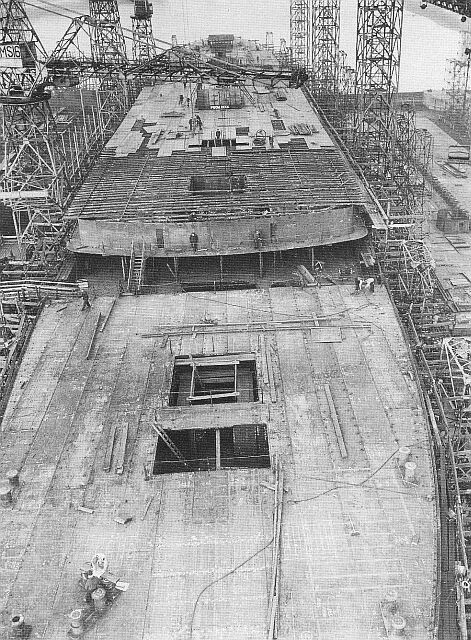 Once the work was completed, she continued on to Sydney, where she entered the Cockatoo Shipyard on 16th April for extensive repairs, returning to duty seventeen days later. 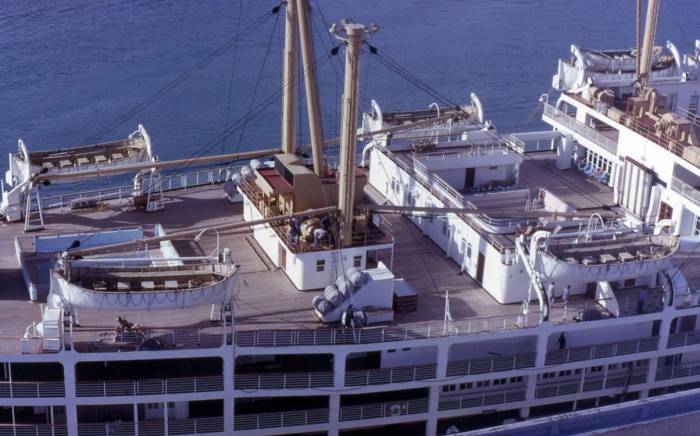 I regret to have to report that the Iberia, outward bound to Australia, was in collision with the Stanvac Pretoria, bound for Bombay, at approximately 175 miles west of Colombo at 12.43 a.m. on the 29th March. 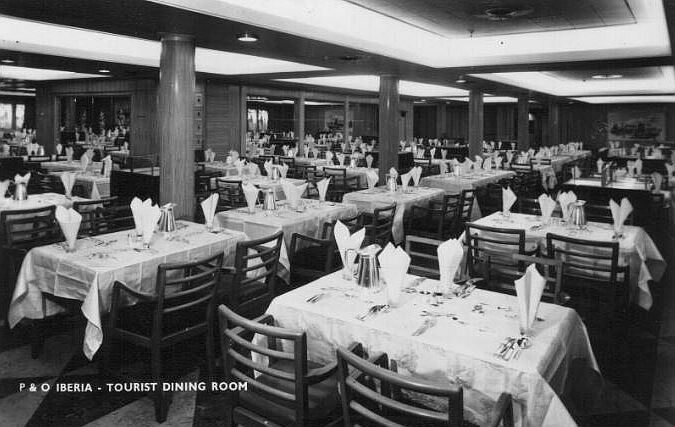 The weather, we understand, was fine and clear. 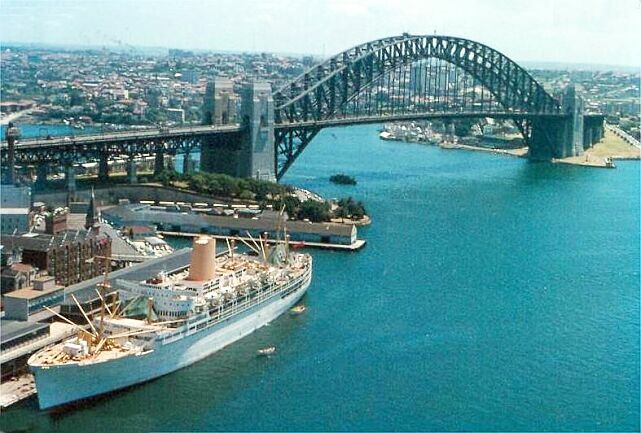 The Stanvac Pretoria is a 10,000 ton tanker owned by A-C Tanker Company Inc. of Panama and New York and under bareboat charter to the Standard Vacuum Transportation Co. Ltd. of Kingsway, London. 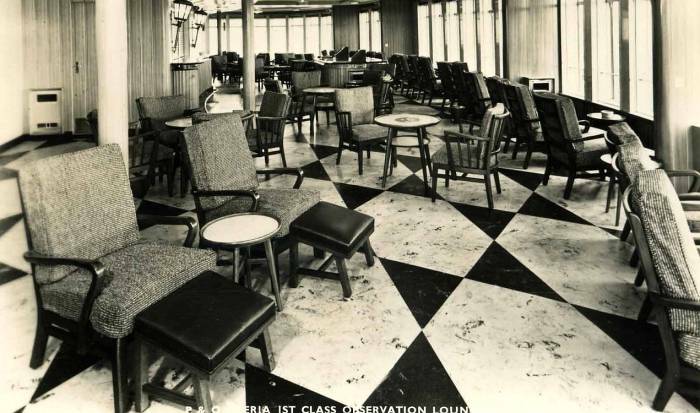 I am glad to say the Commander has reported there were no casualties on board the Iberia. 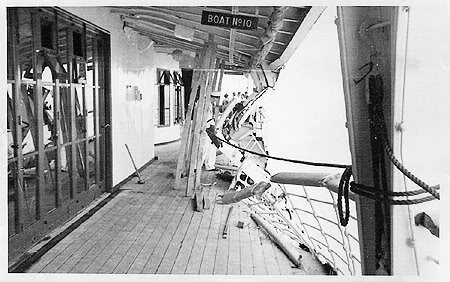 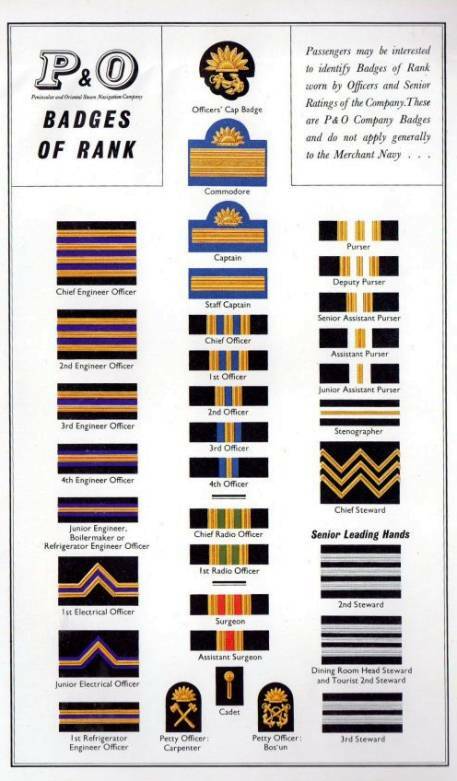 The point of contact was on the port side just abaft amidships and the damage sustained extends roughly to 80’ of the boat deck and to a lesser degree on the promenade deck and “A” deck, with a distortion of frames on “D” deck. 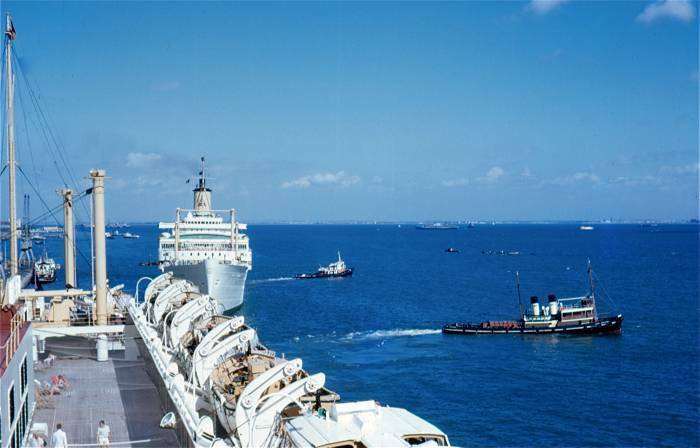 The vessel was delayed in Colombo four days for essential temporary repairs and permanent repairs will be effected in Sydney, whichit is estimated will require eighteen days. 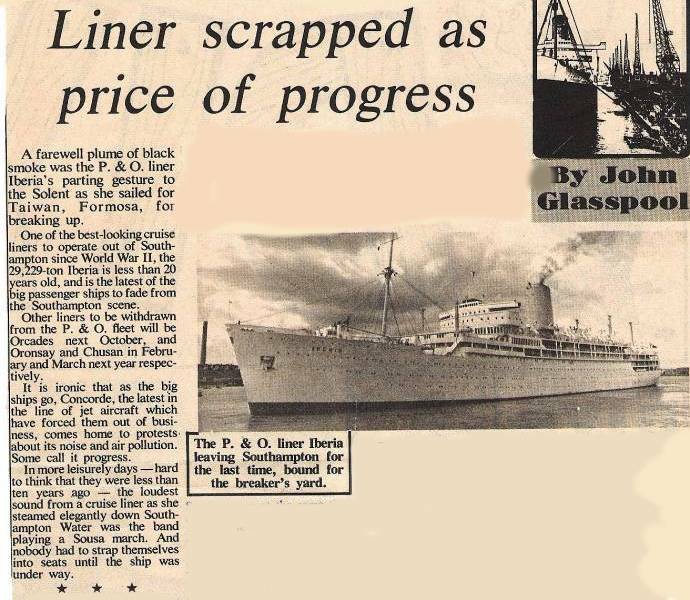 On the assumption that permanent repairs can be effected at Sydney in eighteen days we anticipate the vessel will now arrive in London on the 7th June, fifteen days later than programmed. 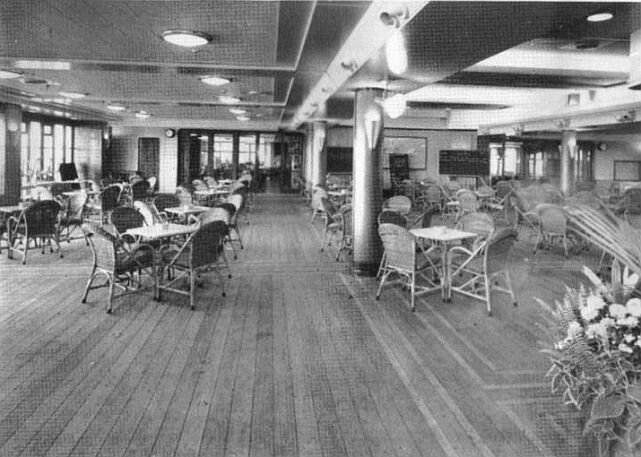 We have therefore no alternative but to cancel her first cruise of twenty days which was programmed to leave London on the 2nd June, and it is hoped that the time available between her arrival in London and departure for the second cruise on the 23rd June will be utilised for turbine repairs, which had been arranged to take place after the cruising season. 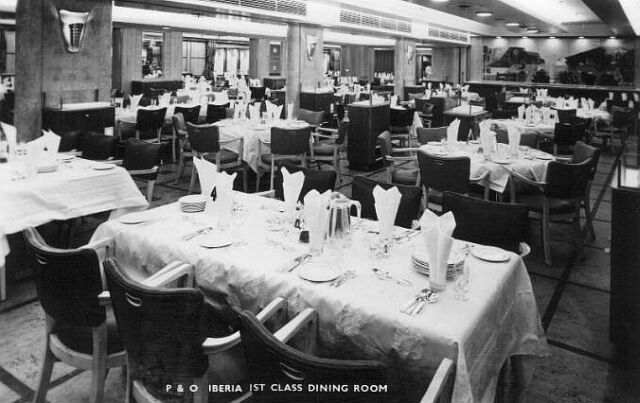 In 1966 Iberia's passenger capacity was revised to 651 First Class and 733 Tourist. 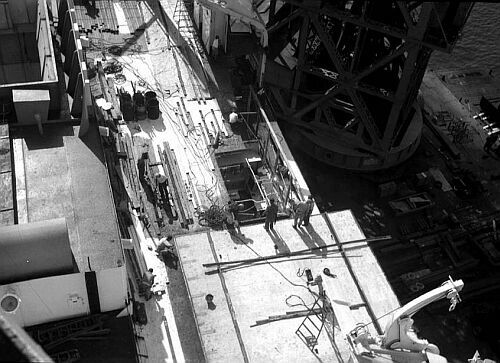 On June 10, 1966, on her way to Yokohama from Kobe, she had to return for repairs to a turbine coupling. 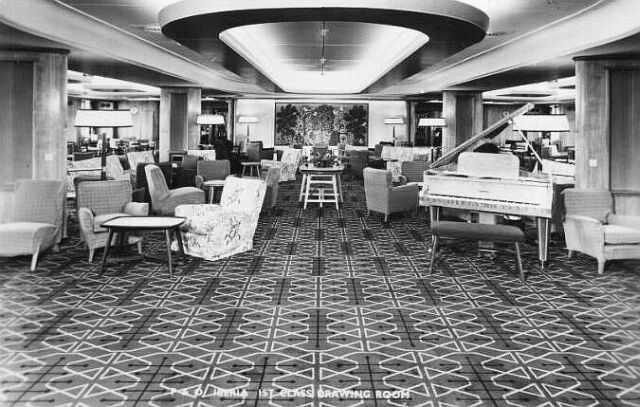 This delayed her voyage by four days. 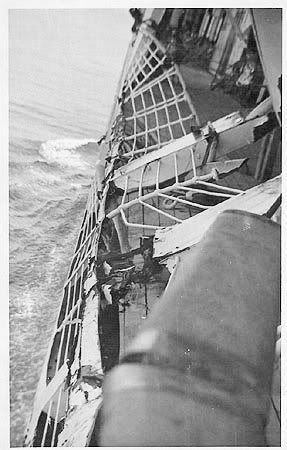 On 19th January 1967, she collided with the jetty at Funchal, Madeira, damaging her bow plates 2.5 metres above the waterline. 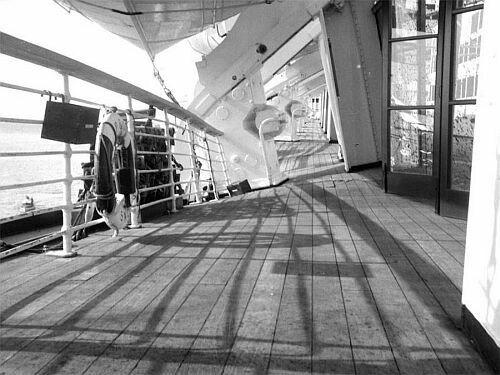 On 2nd February 1968 she was delayed at Funchal for two days with a power system breakdown. 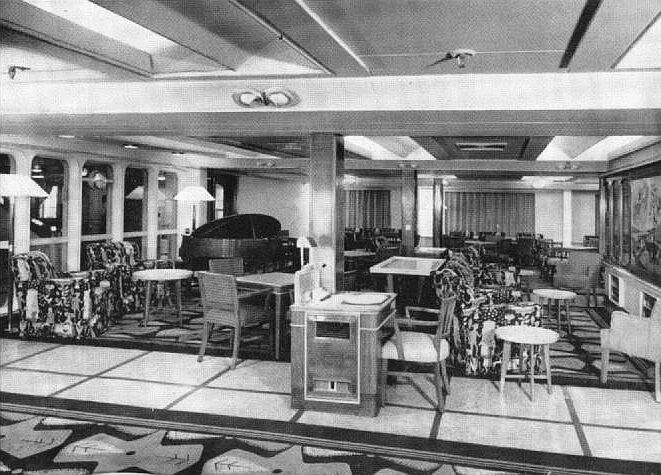 On 16th November 1968 her number 2 boiler room forced draught fan failed. 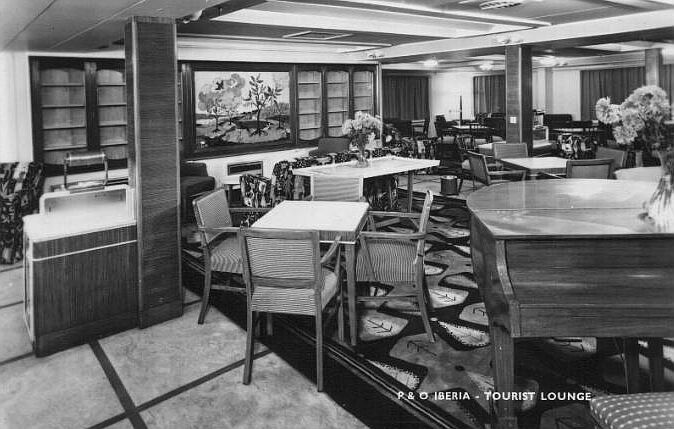 Repairs were made at Dakar, delaying the voyage by 24 hours. 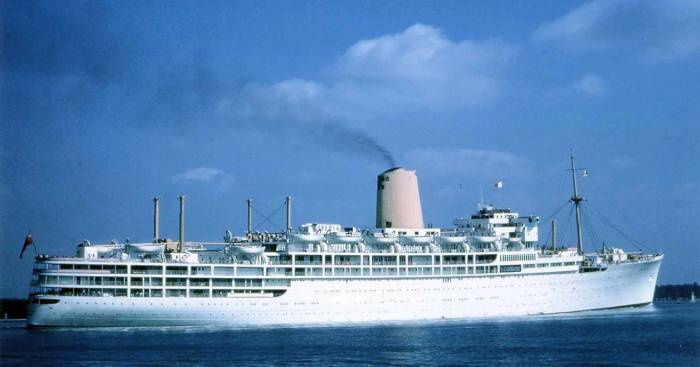 On 12th June 1969 she sailed on her final voyage from London's Tilbury Docks, bound for Australia, returning to P&O's new terminus at Southampton. 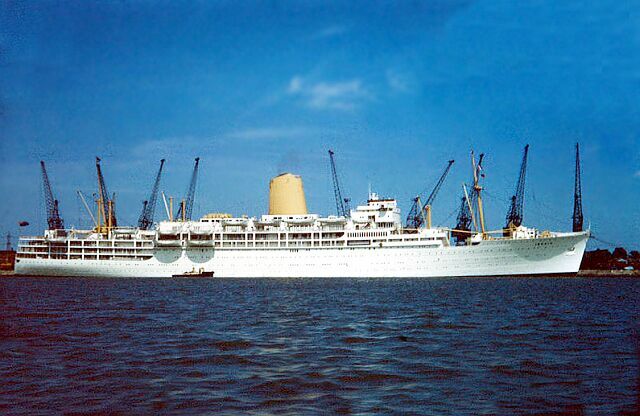 On 8th December 1969, she arrived in Southampton from Australia after a much troubled voyage: whilst at Pago Pago her funnel caught fire; she suffered an electrical failure in Honolulu; her starboard engine failed before she arrived at Acapulco and whilst bunkering in Curacao, it was discovered that fuel oil was leaking into a first class baggage room, eventually flooding the compartment. 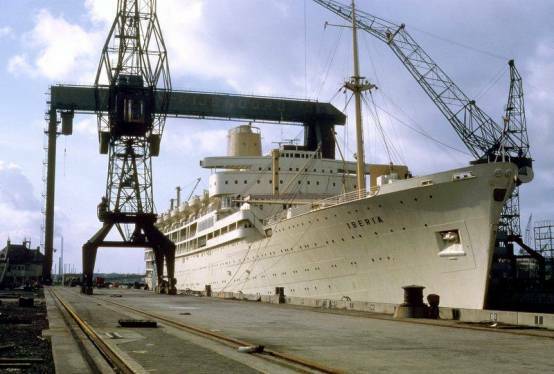 On 9th December 1969, she underwent a major two week overhaul in dry dock at Southampton, which included the removal of her mainmast, similar to Arcadia. 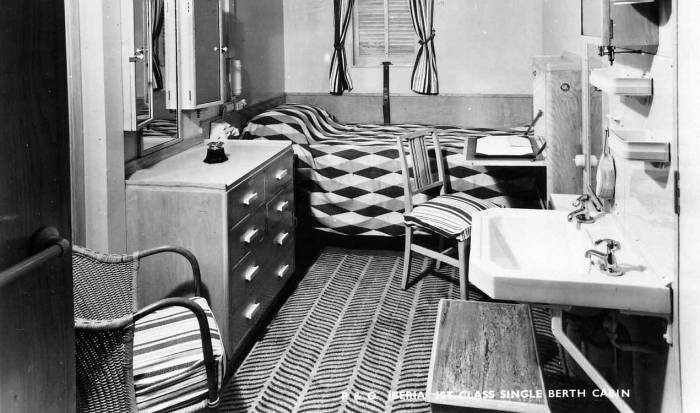 Operating a boat service from the starboard gangway. 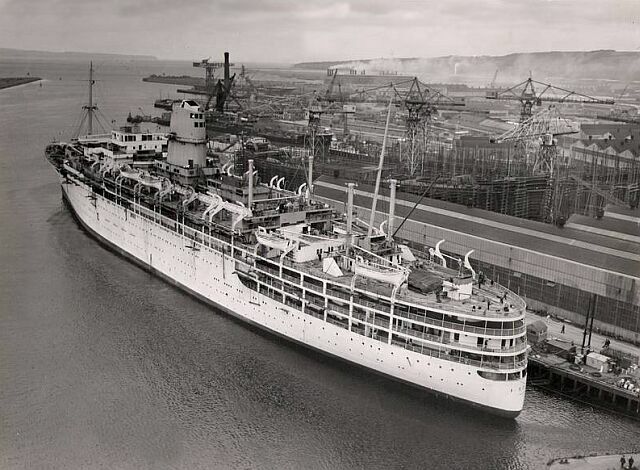 Iberia in drydock for maintenance. 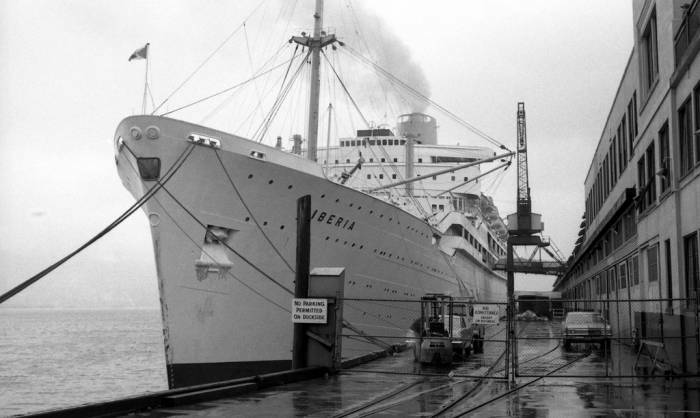 On November 6, 1971 Iberia sailed from Southampton on her final voyage from the UK bound for Cherbourg, Panama, the USA, Canada and Sydney. 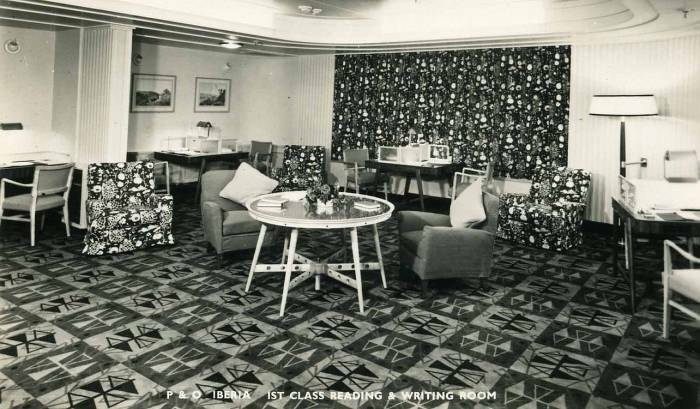 But then in February 1972 it was announced that the she would be retired from service. 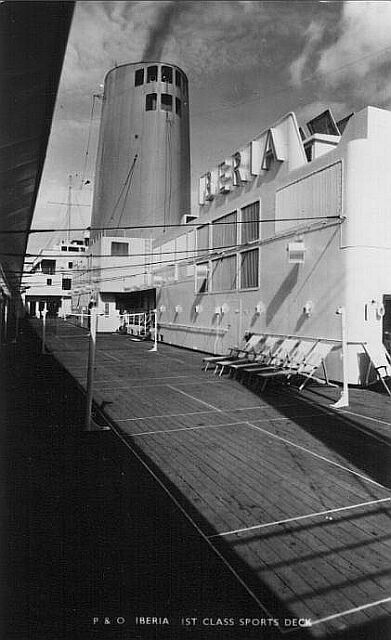 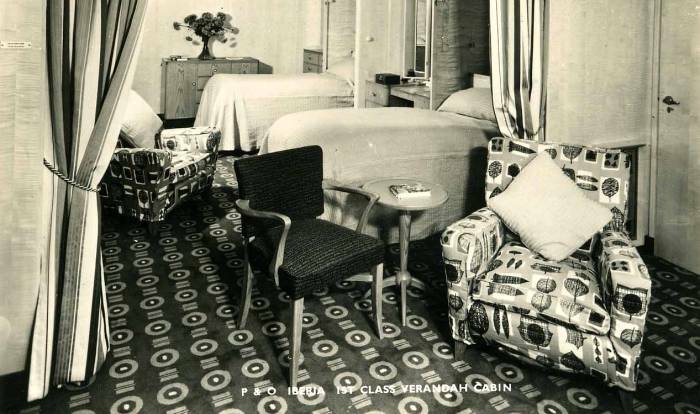 Iberia would be the first of P&O's post war liners to be disposed of as the line voyage loadings were becoming less popular, and she was not proving as popular as Arcadia as a cruise ship. 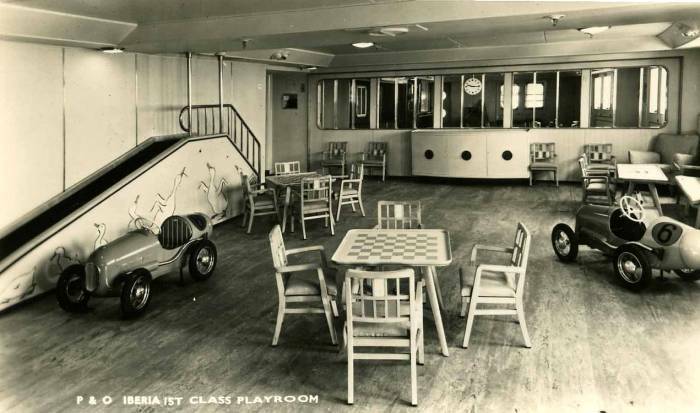 In addition, she took precedence over her sisters due to her poor mechanical performance over the years, having been a much troubled ship, whilst her sisters had enjoyed a relatively good run. 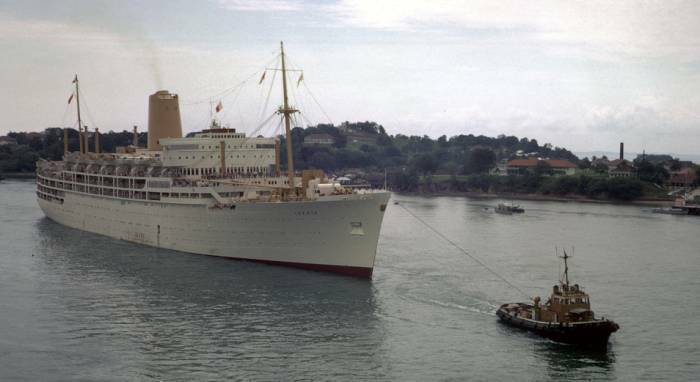 Iberia was withdrawn from service in 1972 arriving at Southampton for the last time on Wednesday 19th April, flying an 18ft paying off pennant. 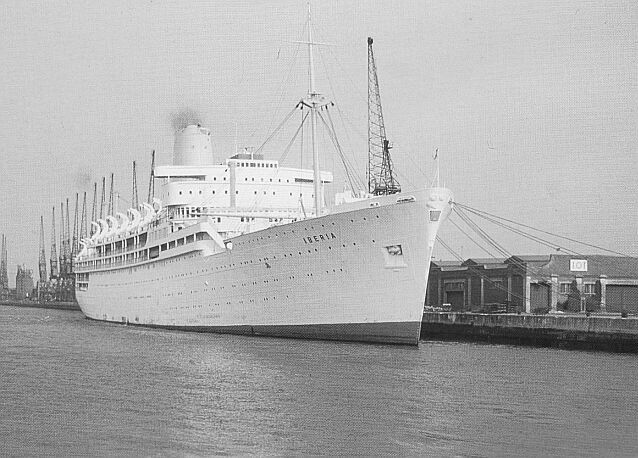 Captain Trenfield rang ‘finished with engines’ and Iberia was laid up at berth 101, awaiting a buyer. 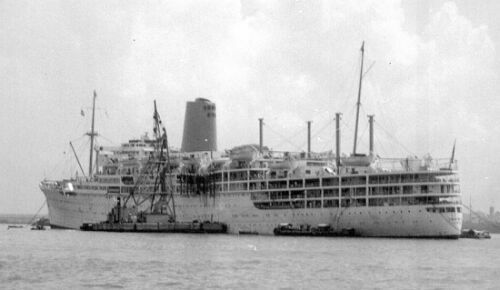 Taiwanese ship breakers, Tong Cheng Steel Manufacturing Co. Ltd, soon purchased her, and dismantling commenced on 17th October 1972.